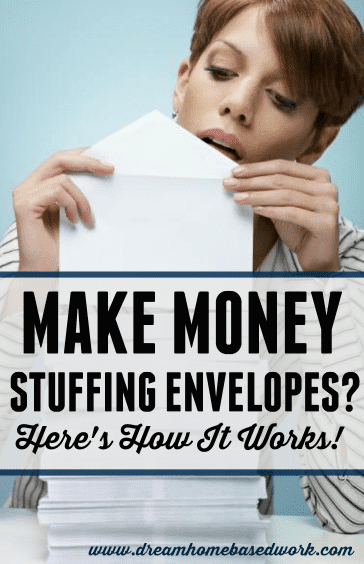 Make Money Stuffing Envelopes from Home: Legit or A Scam? Home » Latest from the Blog » Work from Home » Advice and More » Make Money Stuffing Envelopes from Home: Legit or A Scam? When you are looking for a job that you can do without having to leave the comfort of your own home, stuffing envelopes can look pretty good. The problem is being able to tell whether the offer you are getting is legitimate or if it is a scam. Many people have no idea how to tell the difference, especially because the wording on the advertisement seems to well put together. However, here are some things you should take into consideration that can help you figure out if this is legitimate, or just a scam. To begin with, you want to look at the deal logically. Is it more efficient for a human being to stuff envelopes or for a machine to do it? Machines are definitely a lot faster than humans. Machines are both time saving and cost effective. In addition, if they have to mail the work to each person wherever they live, that only brings delays and additional costs making the idea of envelope stuffers almost ludicrous. In truth, it makes no financial sense whatsoever. In order to spot a scam you need to ask yourself whether or not the idea makes sense. How Does Envelope Stuffing Work? The ad will say that you need to make an investment of purchasing a starter kit, or for the materials you will use or even an investment for having this great and convenient opportunity. Depending on what you are paying for, the fee will vary. Once you send the money, you will wait to receive the kit at the time indicated, but you will be waiting in vain. There are others though that may be ‘kind’ enough to send you the kit. You do the work as you have been instructed, complete it and sent it back to your employer and await your payment. In some cases, you will not get any response at all, but in others you may find that no matter how good your work is, you will be told over and over again that it just does not meet the standard of the company you are working for and therefore cannot be compensated. On looking back at the terms you had been given, you will indeed find that the work can only be paid on meeting company standards, the only problem will be that you have no idea what those standards are. In some instances you may find that there is a bonus paid out to those who introduce others to the job. Excitedly you convince some of your friends to sign on only to discover that since no money is being made, the whole thing collapses, just like the pyramid schemes do. Today many people are onto the scam and are not falling prey to the scammers as much. Basically, if you are suspicious of an offer like this one, look closely at it, consider whether or not it makes sense, and then make your decision.